Ganesh is a deity that is part of the mythical pantheon in India. Ganesh is invocated as the most important deity for the Remover of Obstacles in the Indian Mythology. Interestingly the word “Myth” is related to “Mother” and "Matter.” Myth is the womb of creation. Big Head - Introspective. He is interested in contemplation, meditation, he is a big thinker. Big Flapping Ears - The best listener. Not only does he listen with his ears, but with his heart, soul and mind. Elephants Trunk - represents Strength and discernment. It can uproot a tree but also find a needle in a hay stack. 2 Tusks - One is broken and one is whole - Represents the idea that life always comes in opposites. Joy and suffering, hot and cold. Without contrast there will be no experience in life. Big Tummy - Ganesh can digest the problems of the world. Feet - One foot on the ground and one foot raised - Ganesh lives in both the Absolute and the relative. Rat - Next to his feet - represents the temptation that is always there, even in enlightened beings, (Leish-a-Vidya). Ganesh is the symbolic representation of the state of consciousness in which all obstacles are transformed into opportunities. Ganesha is the embodiment of fearlessness. Knowing there is no “other” will mean you cannot conceive fear. Knowing I and the universe are one. The lord of all protectors of knowledge. “Gana” = Protector/guardian. Ganesh is the epitome of earth element. We invocate that state of consciousness in our own awareness so we can incarnate this higher consciousness in our being, thoughts, speech and in our activity. Consciousness using symbolism can help us manifest our deepest desires. This is the role statues (murtis) and photos play. 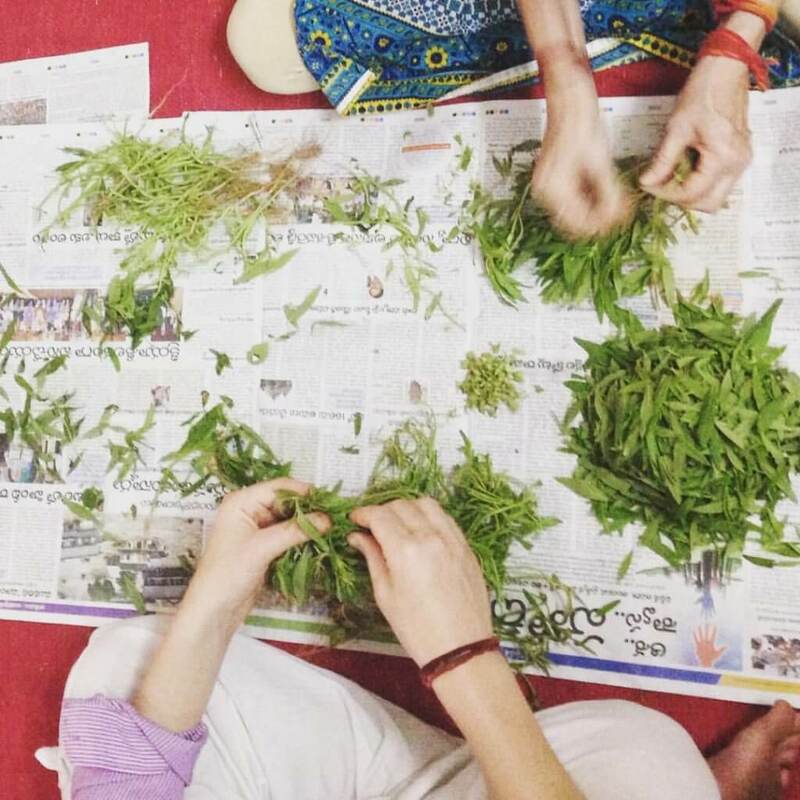 While Duurva (Cynodon dactylon) is the grass of deity Ganesh, Dronapuspi (Leucas aspera) is the leafy green of Ganesh. Dronapuspi is a great anti-viral and effectively cleanses the liver. Pick the medicinal leaves off the Dronapuspi plant and also collect the flowers for offering. Interestingly, this herb is quite rare. 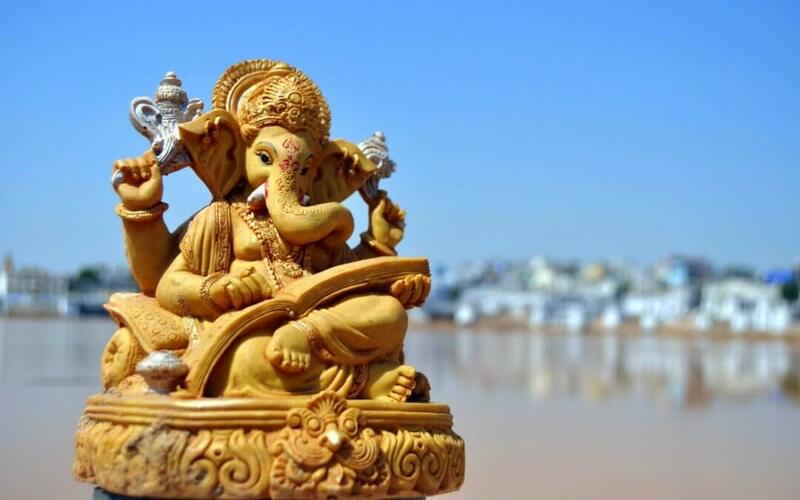 However it is available once a year at the time of Ganesh's birthday (Ganesh Chaturthi). Even more interestingly, it is said that during Ganesh Chatruthi, it is compulsory to take this herb as it's anti-viral properties are very relevant during the rainy season (Vrsa Rtu). So, on Ganesh's birthday enjoy this herb as the 1st taste at lunch with some tamarind and plain rice. Other Common Names of Ganesha: Vigneshwara, Ganapati. Family Status: The step-son of Lord Shiva. Dylan favourite Ganesh temple: Kanipakam Vinayaka Vari Devasthanam. Check out our special medicated ghee prepared with help from Ganesh.